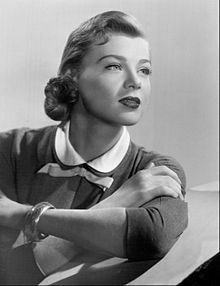 Nita Talbot (born Anita Sokol; August 8, 1930) is an American actress. Talbot was a leading lady who spent the first decade or so of her career playing "slick chicks" and sharp-witted career girls. Talbot received an Emmy Award nomination for Best Supporting Actress in a Comedy Series for the 1967–68 season of Hogan's Heroes. Born in New York City, Talbot began her acting career appearing as a model in the 1949 film It's a Great Feeling. She was afforded a wealth of varied screen roles, from the love-starved switchboard operator in A Very Special Favor (1965) to the brassy Madame Esther in Buck and the Preacher (1972). She also appeared in such films as Bright Leaf (1950), This Could Be the Night (1957), I Married a Woman (1958), Who's Got the Action? (1962), Girl Happy (1965), The Day of the Locust (1975), Serial (1980), Chained Heat (1983), Fraternity Vacation (1985), and Puppet Master II (1991). Between 1966 and 1971, she appeared in seven episodes of Hogan's Heroes as "White Russian" spy Marya,:465–466 a role for which she was nominated for a Primetime Emmy Award for Best Supporting Actress in a Comedy Series in 1968 for the 1967 episode "The Hostage". Talbot has been either the star or co-star of several other series, including Man Against Crime, Bourbon Street Beat (four episodes as Lusti Weather), The Secret Storm, and Supertrain,:1040 while guest-starring on others such as Kolchak: The Night Stalker. Talbot also had long-running roles in Search for Tomorrow and General Hospital. On General Hospital, she had the recurring role of Delfina from 1981 to 1983 (and again in 1992), Tiffany Hill's old friend who takes over designing Luke and Laura's wedding. In 1971, Talbot was cast in the pilot episode of the CBS sitcom Funny Face starring actress-comedian Sandy Duncan as Sandy Stockton, a young UCLA student from Illinois majoring in education and making ends meet by working part time as an actress in television commercials for the Prescott Advertising Agency. Talbot played Sandy's agent, Maggie Prescott. Shortly after filming the pilot, CBS picked up the program for the fall of 1971, but revised the format slightly, resulting in Talbot being dropped from the cast. She appeared in "A Stitch in Crime", episode 6 of the second season of Columbo (1973). Her last acting role was in 1997, when she voiced the character of Anastasia Hardy, the businesswoman mother of Felicia Hardy, the Black Cat, in the animated series Spider-Man. Talbot was married to actor Don Gordon (September 7, 1954, to April 11 1958; divorced) and actor Thomas A. Geas (from August 13, 1961, until their divorce). She has one child, a daughter, Nicole Andrea Geas (born 1962), with second husband Thomas Geas (1934-2010). Talbot's older sister, Gloria Stone (born Gloria Sokol, January 5, 1929 - May 13, 2014), was also an actress. 1967 The Cool Ones Dee Dee Howitzer Alternative title: Cool Baby, Cool! 1958 Gunsmoke Sidna Calhoun 1 episode "Land Deal"
1958 Alfred Hitchcock Presents Louise Williams 1 episode "The Percentage"
1959 Maverick Jeannie 2 episodes "Easy Mark" and "Resurrection of Joe November"
1959 Johnny Staccato Narcissa 1 episode "The Man in the Pit"
1960 The Man from Blackhawk Kay 1 episode: "In His Steps"
1966 Daniel Boone Sylvie Du Marais Episode "The Search"
1973 Columbo Marsha 1 episode, "A Stitch in Crime"
1973 Needles and Pins 1 episode, "The Endangered Species"
1974 Kolchak: The Night Stalker Paula Griffin 1 Episode, "The Werewolf"
^ a b Mark, Norman (February 10, 1973). "Star of New Comedy Series Enjoys Talking". Pottstown Mercury. Pennsylvania, Pottstown. Chicago Daily News Service. p. 29. Retrieved June 9, 2017 – via Newspapers.com. ^ a b c d e f g h Terrace, Vincent (2011). Encyclopedia of Television Shows, 1925 through 2010 (2nd ed.). Jefferson, N.C.: McFarland & Company, Inc., Publishers. p. 128. ISBN 978-0-7864-6477-7. ^ "Emmy Awards search". EMMYS. Television Academy. Archived from the original on June 10, 2017. Retrieved June 10, 2017. ^ Biography, hollywood.com; accessed March 24, 2018. ^ Mercer, Charles (July 14, 1955). "Nita Talbot Tabbed as New Star". The Corpus Christi Caller-Times. Corpus Christi, TX. Associated Press. p. 38. Retrieved June 9, 2017 – via Newspapers.com. ^ "The Man from Blackhawk". Classic Television Archive. Retrieved January 30, 2013.